This test proves Nuke Em's ability to prolong the shelf life of fruit by controlling powdery mildew and Botrytis. The strawberries on the left have been rinsed with Nuke Em, the strawberries on the right have not. Capillary matting has been placed under both samples. 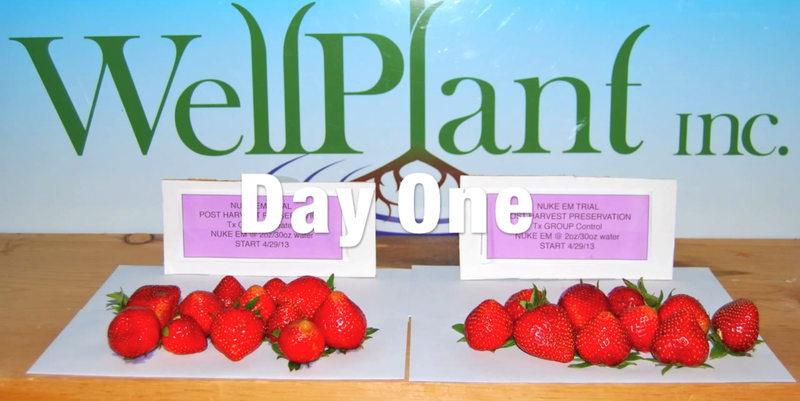 Watch for liquid coming from the decomposing berries and mold on the untreated right side while the berries on the treated left side remain solid and mold free. Produce can be sprayed with Nuke Em to keep mold and mildew from growing while in the drying process. You can’t smell or taste Nuke Em after it has dried. It will not damage or devalue produce. Nuke Em has no heavy oils, detergents or heavy metals in its formula. Nuke em may be used before, during or after harvests to kill and control leaf insects, powdery mildew, mold and Botrytis.